The true horizon is horizontal. It surrounds the observer and it is typically assumed to be a circle, drawn on the surface of a perfectly spherical model of the Earth. Its center is below the observer and below sea level. Its distance from the observer varies from day to day due to atmospheric refraction, which is greatly affected by weather conditions. Also, the higher the observer's eyes are from sea level, the farther away is the horizon from the observer. For instance, in standard atmospheric conditions, for an observer with eye level above sea level by 1.70 metres (5 ft 7 in), the horizon is at a distance of about 5 kilometres (3.1 mi). 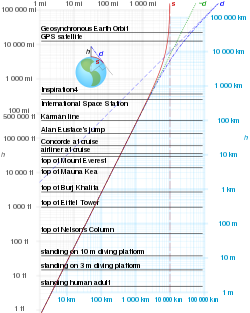 When observed from very high standpoints, such as a space station, the horizon is much farther away and it encompasses a much larger area of Earth's surface. In this case, it becomes evident that the horizon more closely resembles an ellipse than a perfect circle, especially when the observer is above the equator, and that the Earth's surface can be better modeled as an ellipsoid than as a sphere. The word horizon derives from the Greek "ὁρίζων κύκλος" horizōn kyklos, "separating circle",, where "ὁρίζων" is from the verb ὁρίζω horizō, "to divide", "to separate", which in turn derives from "ὅρος" (oros), "boundary, landmark". Historically, the distance to the visible horizon has long been vital to survival and successful navigation, especially at sea, because it determined an observer's maximum range of vision and thus of communication, with all the obvious consequences for safety and the transmission of information that this range implied. This importance lessened with the development of the radio and the telegraph, but even today, when flying an aircraft under visual flight rules, a technique called attitude flying is used to control the aircraft, where the pilot uses the visual relationship between the aircraft's nose and the horizon to control the aircraft. A pilot can also retain his or her spatial orientation by referring to the horizon. In many contexts, especially perspective drawing, the curvature of the Earth is disregarded and the horizon is considered the theoretical line to which points on any horizontal plane converge (when projected onto the picture plane) as their distance from the observer increases. For observers near sea level the difference between this geometrical horizon (which assumes a perfectly flat, infinite ground plane) and the true horizon (which assumes a spherical Earth surface) is imperceptible to the naked eye[dubious – discuss] (but for someone on a 1000-meter hill looking out to sea the true horizon will be about a degree below a horizontal line). In astronomy the horizon is the horizontal plane through the eyes of the observer. It is the fundamental plane of the horizontal coordinate system, the locus of points that have an altitude of zero degrees. While similar in ways to the geometrical horizon, in this context a horizon may be considered to be a plane in space, rather than a line on a picture plane. One typically sees further along the Earth's curved surface than a simple geometric calculation allows for because of refraction error. If the ground, or water, surface is colder than the air above it, a cold, dense layer of air forms close to the surface, causing light to be refracted downward as it travels, and therefore, to some extent, to go around the curvature of the Earth. 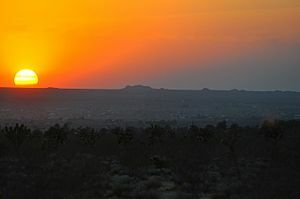 The reverse happens if the ground is hotter than the air above it, as often happens in deserts, producing mirages. 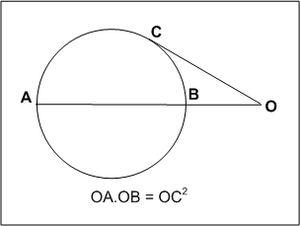 As an approximate compensation for refraction, surveyors measuring distances longer than 100 meters subtract 14% from the calculated curvature error and ensure lines of sight are at least 1.5 meters from the ground, to reduce random errors created by refraction. where d is in kilometres and h is height above sea level in metres. The constant 3.57 has units of km/m½. where the constant 1.22 has units of mi/ft½. In this equation Earth's surface is assumed to be perfectly spherical, with radius equal to about 6,371 kilometres (3,959 mi). For an observer standing on a hill or tower 30 metres (98 ft) above sea level, the horizon is at a distance of 19.6 kilometres (12.2 mi). For an observer standing on a hill or tower 100 metres (330 ft) above sea level, the horizon is at a distance of 36 kilometres (22 mi). For an observer standing on the roof of the Burj Khalifa, 828 metres (2,717 ft) from ground, and about 834 metres (2,736 ft) above sea level, the horizon is at a distance of 103 kilometres (64 mi). On terrestrial planets and other solid celestial bodies with negligible atmospheric effects, the distance to the horizon for a "standard observer" varies as the square root of the planet's radius. Thus, the horizon on Mercury is 62% as far away from the observer as it is on Earth, on Mars the figure is 73%, on the Moon the figure is 52%, on Mimas the figure is 18%, and so on. If the Earth is assumed to be a featureless sphere (rather than an oblate spheroid) with no atmospheric refraction, then the distance to the horizon can easily be calculated. Graphs of distances to the true horizon on Earth for a given height h. s is along the surface of the Earth, d is the straight line distance, and ~d is the approximate straight line distance assuming h << the radius of the Earth, 6371 km. In the SVG image, hover over a graph to highlight it. If the Earth were an airless world like the Moon, the above calculations would be accurate. However, Earth has an atmosphere of air, whose density and refractive index vary considerably depending on the temperature and pressure. This makes the air refract light to varying extents, affecting the appearance of the horizon. Usually, the density of the air just above the surface of the Earth is greater than its density at greater altitudes. This makes its refractive index greater near the surface than at higher altitudes, which causes light that is travelling roughly horizontally to be refracted downward. This makes the actual distance to the horizon greater than the distance calculated with geometrical formulas. With standard atmospheric conditions, the difference is about 8%. This changes the factor of 3.57, in the metric formulas used above, to about 3.86. For instance, if an observer is standing on seashore, with eyes 1,70 m above sea level, according to the simple geometrical formulas given above the horizon should be 4,7 km away. Actually, atmospheric refraction allows the observer to see 300 metres farther, moving the true horizon 5 km away from the observer. This correction can be, and often is, applied as a fairly good approximation when atmospheric conditions are close to standard. When conditions are unusual, this approximation fails. Refraction is strongly affected by temperature gradients, which can vary considerably from day to day, especially over water. In extreme cases, usually in springtime, when warm air overlies cold water, refraction can allow light to follow the Earth's surface for hundreds of kilometres. Opposite conditions occur, for example, in deserts, where the surface is very hot, so hot, low-density air is below cooler air. This causes light to be refracted upward, causing mirage effects that make the concept of the horizon somewhat meaningless. Calculated values for the effects of refraction under unusual conditions are therefore only approximate. Nevertheless, attempts have been made to calculate them more accurately than the simple approximation described above. The curvature of the horizon is easily seen in this 2008 photograph, taken from a Space Shuttle at an altitude of 226 km (140 mi). 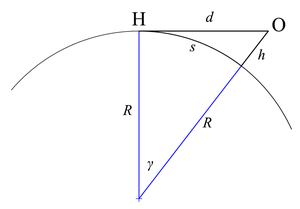 The curvature is the reciprocal of the curvature angular radius in radians. A curvature of 1.0 appears as a circle of an angular radius of 57.3° corresponding to an altitude of approximately 2,640 km (1,640 mi) above Earth's surface. At an altitude of 10 km (6.2 mi; 33,000 ft), the cruising altitude of a typical airliner, the mathematical curvature of the horizon is about 0.056, the same curvature of the rim of circle with a radius of 10 m that is viewed from 56 cm directly above the center of the circle. However, the apparent curvature is less than that due to refraction of light by the atmosphere and the obscuration of the horizon by high cloud layers that reduce the altitude above the visual surface. ^ "Offing". Webster's Third New International Dictionary (Unabridged ed.). Pronounced, "Hor-I-zon". ^ a b c d e f Young, Andrew T. "Distance to the Horizon". Green Flash website (Sections: Astronomical Refraction, Horizon Grouping). San Diego State University Department of Astronomy. Archived from the original on October 18, 2003. Retrieved April 16, 2011. ^ Plait, Phil (15 January 2009). "How far away is the horizon?". Discover. Bad Astronomy. Kalmbach Publishing Co. Archived from the original on 29 March 2017. Retrieved 2017-03-28. ^ Proctor, Richard Anthony; Ranyard, Arthur Cowper (1892). Old and New Astronomy. Longmans, Green and Company. p. 73. Archived from the original on 2017-03-29. ^ Sweer, John (1938). "The Path of a Ray of Light Tangent to the Surface of the Earth". Journal of the Optical Society of America. 28: 327–329. Bibcode:1938JOSA...28..327S. doi:10.1364/JOSA.28.000327. (Subscription required (help)). ^ Anderson, Kirsti (1991). "Brook Taylor's Work on Linear Perspective". Springer. p. 151. ISBN 0-387-97486-5. ^ Stillwell, John (2006). "Yearning for the Impossible". Horizon. A K Peters, Ltd. pp. 47–76. ISBN 1-56881-254-X.